The reigning champion has been dethroned. 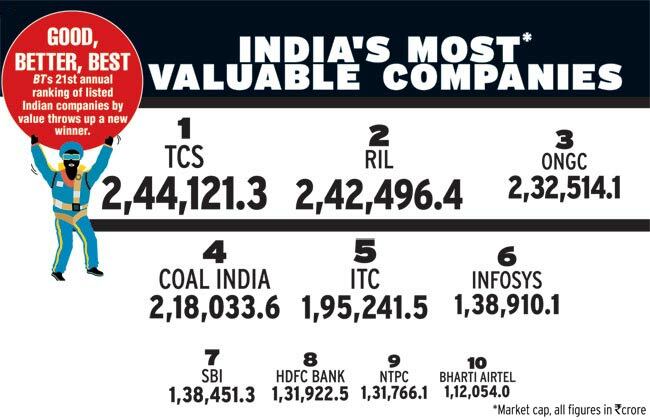 For the last nine years, Reliance Industries Ltd (RIL) had topped the annual BT 500 ranking of India's most valuable companies. But in 2012, as we reached the end of our exhaustive analysis of listed Indian companies to decide which were the most valuable and in what order, we found a new winner had emerged. The star of the new economy in India, software behemoth Tata Consultancy Services, beat RIL, though by a whisker. Does this herald the start of a new kind of rivalry between these two giants? Already RIL has been signalling its intention to win back its lost throne. Our ranking is decided on the basis of average market capitalization for the first half of each financial year. Between April and September, RIL did fall behind TCS. But in the second half it has come roaring back and is currently firmly in the lead on the daily market capitalisation league table. In the package of exciting stories that follows, we provide a detailed account of TCS's climb to the top (A New Champion) as well as of what went wrong at RIL and how it is working to regain lost ground. Another report analyses India's 10 biggest conglomerates, and the pace at which they are growing. Who do you think is growing the fastest? You will find the answer in Fastest of Them All. Indian firms have been snapping up companies abroad in the past decade. With help from global accounting and audit firm Grant Thornton we have listed the 10 companies that have been the most globally acquisitive even after the downturn began in 2008. (A Slice of World Action) While we celebrate the high-rankers' success, we also take stock of the companies which fell behind in the ranking compared to last year and analyse why they did so. (All Fall Down). Labour unrest has taken a particularly violent turn in recent years. Read Why Are They So Angry? which discusses the reasons. There is all this and more.